Balu Blue Foundation Inc. presents a free event to inspire protection and enhancement of the natural environment, a Foreshore Moonlight Cinema screening of Before The Flood. If you could know the truth about the threat of climate change — would you want to know? Before the Flood, presented by National Geographic, features Leonardo DiCaprio on a journey as a United Nations Messenger of Peace, traveling to five continents and the Arctic to witness climate change firsthand. He goes on expeditions with scientists uncovering the reality of climate change and meets with political leaders fighting against inaction. He also discovers a calculated disinformation campaign orchestrated by powerful special interests working to confuse the public about the urgency of the growing climate crisis. With unprecedented access to thought leaders around the world, DiCaprio searches for hope in a rising tide of catastrophic news. From Academy Award®-winning filmmaker Fisher Stevens and Academy Award®-winning actor, environmental activist and U.N. Messenger of Peace Leonardo DiCaprio, Before the Flood presents a riveting account of the dramatic changes now occurring around the world due to climate change, as well as the actions we as individuals and as a society can take to prevent the disruption of life on our planet. Beyond the steps we can take as individuals, the film urges viewers to push their elected officials in supporting the use of alternative energy sources such as solar and wind power. “We need everyone to demand bold action from their political leaders and to elect representatives who have their best interests at heart, not the interests of corporations to perpetuate a cycle of greed and destruction,” says DiCaprio. 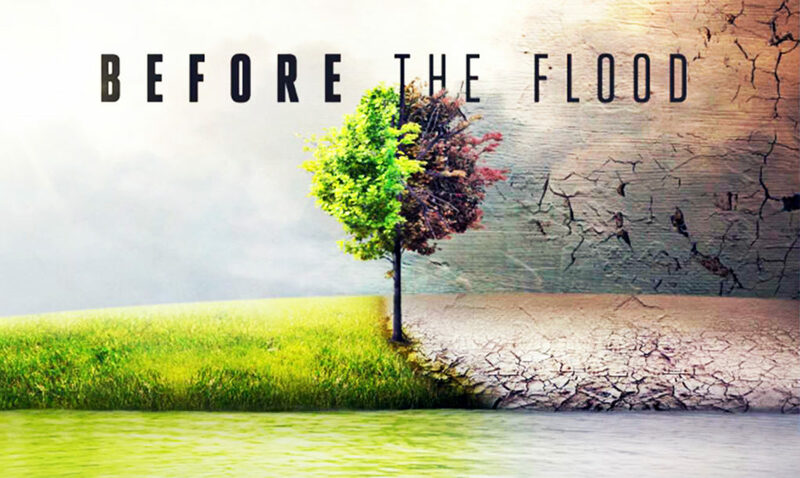 “This documentary shows how interconnected the fate of all humanity is — but also the power we all possess as individuals to build a better future for our planet.” Before the Flood premieres in theaters on October 21st and will air globally on the National Geographic Channel on October 30th in 171 countries and 45 languages. The film is directed by Fisher Stevens and produced by Leonardo DiCaprio, Fisher Stevens, Jennifer Davisson and Trevor Davidoski with Brett Ratner and James Packer of RatPac Entertainment. It was written by Mark Monroe and Executive Produced by Martin Scorsese, Adam Bardach, Mark Monroe, and Zara Duffy. The film is edited by Geoffrey Richman A.C.E., Ben Sozanski, Abhay Sofsky, and Brett Banks. The Director of Photography is Antonio Rossi. The Executive Music Producers are Trent Reznor and Atticus Ross with original music by Trent Reznor and Atticus Ross, Mogwai and Gustavo Santaolalla.